SAN ANTONIO — Nov. 15, 2018 — Dr. Scott Bolton, associate vice president of Southwest Research Institute’s Space Science and Engineering Division, is being honored with a 2018 American Ingenuity Award from Smithsonian Magazine. Deemed the “Golden Globes of Intellect,” these awards honor individuals in nine wide-ranging categories. 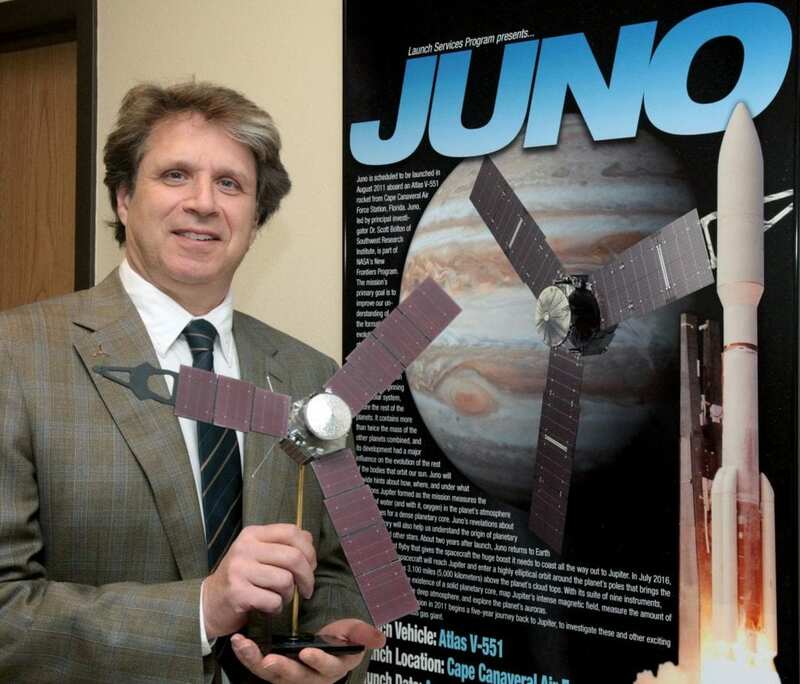 The award recognizes Bolton’s contributions to the physical sciences as principal investigator of NASA’s Juno mission to Jupiter, now about halfway through its prime mission. The mission design, spearheaded by Bolton, combines new technologies and a novel polar orbit to survey the gas giant. And since the spacecraft first buzzed the planet’s colorful cloud tops, Juno discoveries have turned theories about how Jupiter works inside out. The Juno mission has revealed that the largest planet in our solar system is a complex, turbulent world. Jupiter’s iconic belts and zones near the equator persist down deep, while those at other latitudes seem to evolve into other structures. Earth-sized cyclones circle its poles, and Jupiter’s lumpy magnetic field hints that it’s generated closer to the planet’s surface than ever imagined. For the last 14 years, Bolton has led this mission and managed a wide range of scientists and programs at SwRI. Previously, he had 24 years of experience at NASA’s Jet Propulsion Laboratory at Caltech, contributing to planetary missions including Cassini, Galileo and Voyager among many others. His experience includes scientific research, mission development, instrument design, and science planning and operations. “Year after year, the American Ingenuity Awards honor those on the cutting edge of American achievement, revolutionizing American culture by promoting societal progress and activism in their works,” says Smithsonian Editor in Chief Michael Caruso. The 2018 awardees include actor-writer-director John Krasinski, honored for visual arts, and the Parkland survivors, honored in the youth category. The ceremony honoring this year’s winners will be held on December 5, 2018, at the National Portrait Gallery in Washington. Bolton will be featured in Smithsonian magazine’s December issue and will lead a conversation at the National Air and Space Museum during the second annual Smithsonian Ingenuity Festival Nov. 29-Dec. 9, 2018.